The number of multi-sport athletes in the US is dwindling. The young athletes in our country are in a race to specialize in a sport earlier than their peers. This fits right into the American culture of “bigger, better, faster.” We want our kids to excel and we want a success quickly. Some parents dream of their kids getting college scholarships, professional contracts, or even simply the opportunity to live vicariously through their kids’ glory. Consider these facts on multi-sport athletes…. This study from the European Journal of Sport Science showed that only 1/3 of athletes competing at the international level at a young age were still at a high level as an adult (27-24 years old). The Journal of Sports Sciences found male athletes who participated in multiple sports to be more physically fit with better coordination, explosive strength, speed, and agility than athletes specializing in one sport. Most Division I soccer coaches believe that kids should wait until high school or later to focus on soccer. Only 8.5% of coaches felt kids should specialize in soccer in or before middle school. 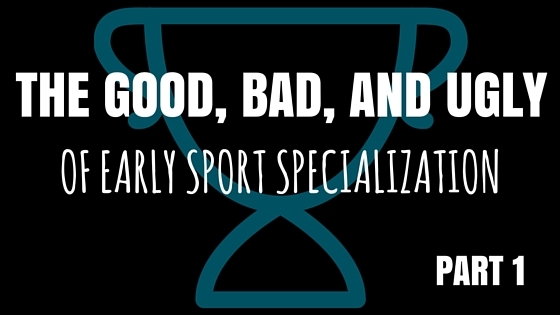 The American Medical Society for Sports Medicine defines early sport specialization as engaging in intensive, year-round training (greater than 8 months/year) within a single sport. This type of training typically limits a child’s exposure to other sports activities. Acute injuries, such as ankle sprains or MCL (medial collateral ligament) tears, happen with trauma. These sudden injuries can’t all be prevented. Overuse injuries occur with repetitive stress to bones and joints . These injuries, for the most part, are avoided with proper training or monitoring of activities. Osgood- Schlatter Disease: Inflammation of the area just below the knee where the tendon from the kneecap (patellar tendon) attaches to the shinbone (tibia). Little league shoulder: An injury caused by excessive stress to the arm bone (humerus) close to the shoulder. This injury causes widening of the growth plate, swelling, and pain in the shoulder. Currently in youth sports, acute and overuse injuries occur at the same rate (50:50). Sadly, the number of overuse injuries (that’s right, the preventable ones) are rising. Multiple studies show that youth who specialize in one sport are at increased risk for overuse injury. A study published last summer in the Sports Health Journal showed a relationship between knee overuse injuries and single-sport athletes in high school basketball, soccer, and volleyball. Burnout is more scientifically known as “overtraining syndrome.” More specifically, it’s decreased athletic performance due to changes in psychology, physiologic, or hormones in an athlete. Signs of burnout in youth athletes include fatigue, lack of enthusiasm for sport, or difficulty with completing usual routines or activities. Athletes and parents must remember that efficient athletic development comes from quality of training and competitions not quantity. Limit weekly and yearly competition in a particular sport as well as sport-specific training. Emphasize skill development more than competition and winning. Closely monitor training workload during the adolescent growth spurt, when injury risk is greater. 3. Muscle and coordination imbalances. Young athletes considered “talented” in only one sport are actually more likely to present with poor fundamental movement skills. This study showed that soccer players who specialized early had larger muscle imbalances (or what we term “quadriceps dominance” in the sports medicine world) than athletes who participated in off-season resistance training. Quadriceps dominance is a major risk factor for non-contact ACL injury. How do we change the US culture to encourage multi-sport youth athletes? Jimmy Andrews, noted sports surgeon, has pleaded with parents and athletes through multiple avenues including his STOP Sports Injuries campaign. Eric Cressey, accomplished Strength and Conditioning Specialist, proposed in a recent blog post that changes need to come from the top-down: professional sports organizations, the NCAA, and high school athletic associations. Check out his article here. In the meantime, steer clear of any coach asking a child to limit his or her athletic talent to one sport. Does your child have an overuse injury? Find out the safest way to recover from it. Contact CLE Sports PT & Performance today for a free, 15-minute consult.